"In the 1960s Wellington's long settled inner suburb of Thorndon was threatened by the proposed construction of a motorway through it. Old houses were pulled down and Wellington's first cemetery was demolished." "When plans for an extension to the southern motorway threatened, Rita Angus adopted the historical pocket of Wellington as a major theme in her work." Rita Angus (Wellington, N.Z. : National Art Gallery, 1982), pp.35, 60. Artist > Centre Gallery 1967 > Brasch > DUHo. 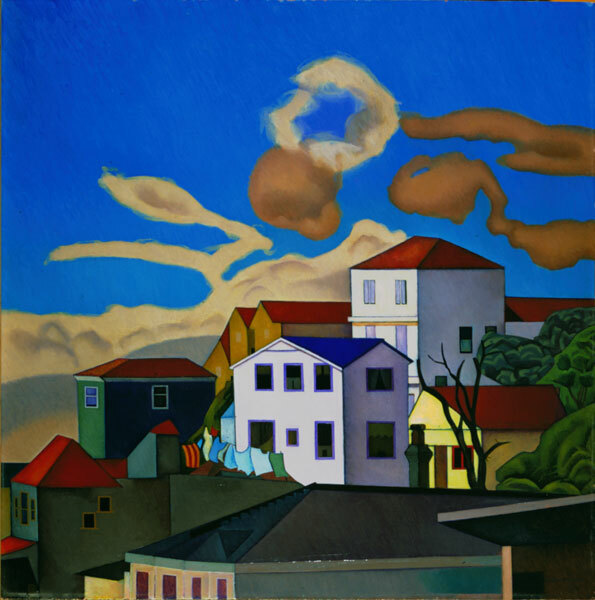 Angus, Rita, 1908-1970, “View from Tinakori Road.,” ourheritage.ac.nz | OUR Heritage, accessed April 22, 2019, http://otago.ourheritage.ac.nz/items/show/5794.